Bradley D. Creech, age 56, of Eaton, passed away Saturday, January 19, 2019. He was born August 5, 1962 in Dayton, OH. Brad was a 1981 graduate of Twin Valley High School. 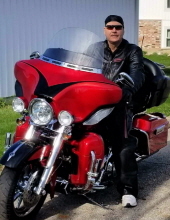 He was an avid fisherman and golfer (professional hacker) and enjoyed riding his Harley Davidson Motorcycle. He worked for 30 years at Neaton Auto Products and for the past several years has been employed at Silfex in Eaton. He is survived by his mother JoAn Birkhead of Eaton; father Bud (Ann) Creech of Lewisburg; sons Kyle Creech and Kevin Creech both of Eaton; grandchildren: Kacey, Kaylee and Krystal Creech; brother Mark (Sheryl) Creech of Eaton; sister Nikki (Josh) Fox of West Alexandria; nephews Ryan (Christine) Creech and Bradley Creech; and several great nieces and nephews. Visitation will be held on Friday, January 25, 2019 from 1:30 pm until time of funeral service at 3:00 pm at the Girton Schmidt & Boucher Gard Funeral Home, 226 West Main Street, Eaton with casual attire. Burial will follow at Preble Memory Gardens in West Alexandria. Memorial contributions may be sent to Ohio Division of Wildlife, c/o Central Office, 2045 Morse Road Building G-1, Columbus, OH 43229-6693. Online condolences and other remembrances may be sent to the family by visiting www.gsbfuneralhome.com. To send flowers or a remembrance gift to the family of Bradley D. Creech, please visit our Tribute Store. c/o Central Office 2045 Morse Road Building G-1 Columbus, OH 43229-6693. "Email Address" would like to share the life celebration of Bradley D. Creech. Click on the "link" to go to share a favorite memory or leave a condolence message for the family.